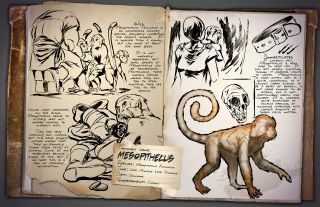 Ark: Survival Evolved is a survival game set on an island filled with creatures that are now extinct, so it makes sense that the developers would add a mesopithecus, a breed of monkey ("pithecus" means ape) that's no longer around. In the game, these monkeys are useful for throwing poo at people, which is apparently harmful, or even attacking them more directly. You can also throw them over walls, which they don't seem to mind as much as they probably should, so that they can open doors for you. And they can ride around on your shoulder. All while wearing a fetching hat! I kind of wish I had one in real life. I predict they'd be much easier to train than a dinosaur. Those who've been watching the "Survival of the Fittest" tournament would probably also like to know that the final takes place today. You can watch that on Twitch.